I can’t wait to meet more flavors of marshmallows. If they are all as nice as these, then I’m going to consider marrying into the family. 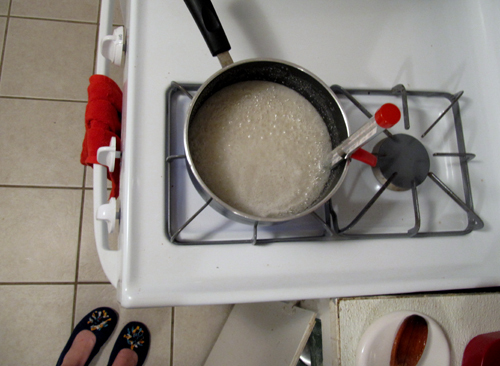 Check it out: boiling sugar-ness and patient slipper feet. …and my open cupboard because I always leave them open. 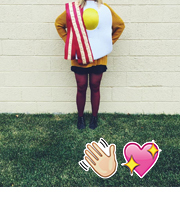 Perfect for tripping and exclamations. I’m going to be honest and say that these didn’t really take that long. They were surprisingly painless despite my months of putting them off. They are a nice light dessert that I’d like to keep around forever. Powdered sugar sprinkling is one of my skills. It’s on my resumé. I’d like to take a nap on that marshmallow down there. I’d like to do that right now. Oil the bottom and sides of a 9 x 13 x 2 inch rectangle baking pan and dust the bottom and sides generously with confectioners’ sugar. In the bowl of a stand mixer or in a large bowl sprinkle gelatin over 1/2 cup cold water and set aside to soften. in a 3-quart or medium heavy saucepan cook granulated sugar, corn syrup, second 1/2 cup of cold water, and salt over a low heat, stirring with a wooden spooon, until sugar is dissolved. Increase heat to medium and boil mixture, without stirring, until a candy thermometer registers 240ºF, about 12 minutes. Remove pan from heat and pour sugar mixture over gelatin mixture, stirring until gelatin is dissolved. 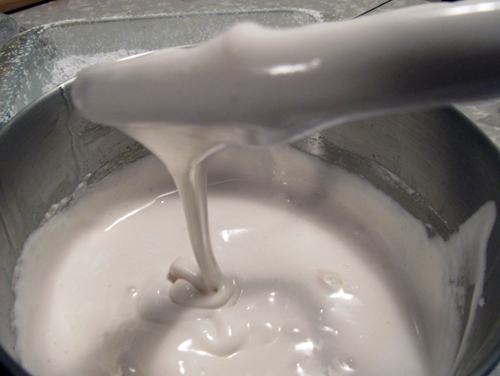 With a standing or hand-held electric mixer beat mixture on high speed until white, thick and nearly tripled in volume, about 6 minutes using a stand mixer or about 10+ minutes using a hand-held mixer. In a separate medium bowl with clean beaters beat egg whites until they just hold stiff peaks. Beat whites and vanilla (or your choice of flavoring and food coloring , if using) into sugar mixture and beat until just combined. Pour mixture into prepared baking dish. 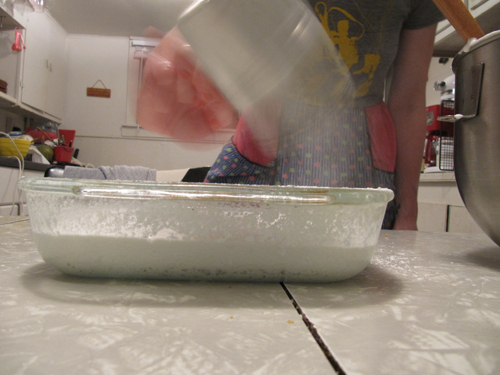 Sift 1/4 cup confectioners’ sugar evenly over top. 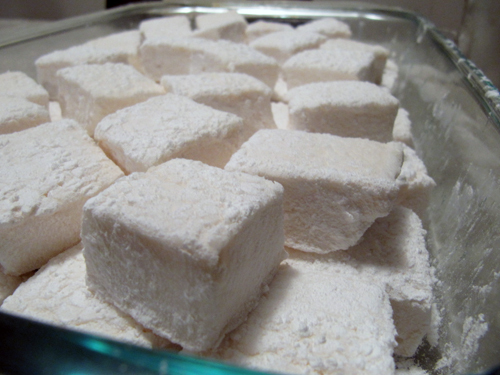 Chill marshmallows, uncovered, until firm, at least three hours and up to one day. Run a thin knife around edges of pan and invert pan onto a large cutting board. 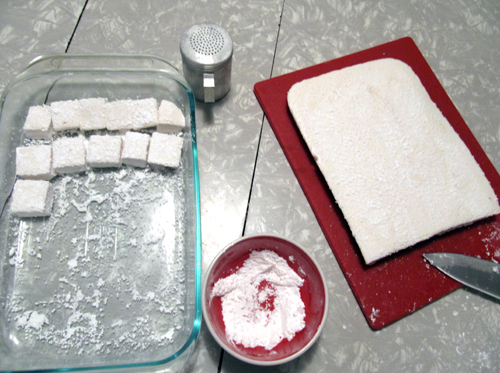 Lifting up one corner of inverted pan, with fingers loosen marshmallow and ease onto cutting board. 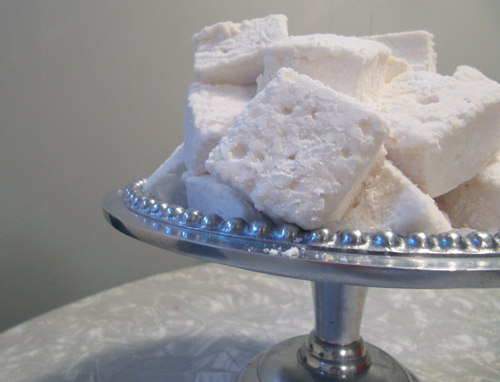 With a large knife cut marshmallows into squares. Roll through confectioners’ sugar and shake off excess before putting back in you now empty baking pan. Cover and store in an air-tight container at cool room temperature for up to 1 week. Pile these guys on a little cake stand. Serve them up as dessert. 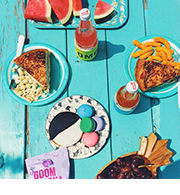 Daydream about s’mores and hot chocolate. These marshmallows are beautiful! I love that you piled them on a cake stand. I’m wondering if you could dip them in chocolate… yum! Thanks Katie! I think you totally could tip them in chocolate. I decided to keep it wholesome this time and next time I want to dunk them in chocolate and coconut and all kinds of goodness.